Having survived much of the past two centuries without rights to their homeland or any self-governing abilities, the Chemehuevi were a mostly “forgotten” people until the creation of the Twenty-Nine Palms Reservation in 1974. Since then, they have formed a tribal government that addresses many of the same challenges faced by other tribes, including preserving cultural identity and managing a thriving gaming industry. 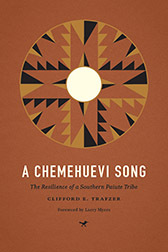 The Chemehuevi believe that their history and their ancestors are always present, and Clifford Trafzer honors that belief through his emphasis on individual and family stories. In doing so, he not only sheds light on an overlooked tribe but also presents an important new model for tribal history scholarship. Chemehuevi voices, both past and present, are used to narrate the story of the tribe’s tireless efforts to gain recognition and autonomy. The end result is a song of resilience. For the vast majority of Native American students in federal Indian boarding schools at the turn of the twentieth century, the experience was nothing short of tragic. Dislocated from family and community, they were forced into an educational system that sought to erase their Indian identity as a means of acculturating them to white society. However, as historian John Gram reveals, some Indian communities on the edge of the American frontier had a much different experience — even influencing the type of education their children received. 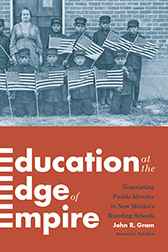 Shining a spotlight on Pueblo Indians’ interactions with school officials at the Albuquerque and Santa Fe Indian Schools, Gram examines two rare cases of off-reservation schools that were situated near the communities whose children they sought to assimilate. Far from the federal government’s reach and in competition with nearby Catholic schools for students, Indian boarding school officials were in no position to make demands and instead were forced to pick their cultural battles with nearby Pueblo parents, who visited the schools regularly. As a result, Pueblo Indians were able to exercise their agency, influencing everything from classroom curriculum to school functions. They often mitigated the schools’ assimilation efforts and assured the various pueblos’ cultural, social, and economic survival. In recent years, global attention has focused on how women in communities of Muslims are revitalizing Islam by linking interpretation of religious ideas to the protection of rights and freedoms. Humanizing the Sacred demonstrates how Sunni women activists in Malaysia are fracturing institutionalized Islamic authority by generating new understandings of rights and redefining the moral obligations of their community. Based on ethnographic research of Sisters in Islam (SIS), a nongovernmental organization of professional women promoting justice and equality, Basarudin examines SIS members’ involvement in the production and transmission of Islamic knowledge to reformulate legal codes and reconceptualize gender discourses. By weaving together women’s lived realities, feminist interpretations of Islamic texts, and Malaysian cultural politics, this book illuminates how a localized struggle of claiming rights takes shape within a transnational landscape. It provides a vital understanding of how women “live” Islam through the integration of piety and reason and the implications of women’s political activism for the transformation of Islamic tradition itself. This entry was posted in Conference Preview, Native American and Indigenous Studies and tagged Asian Studies on the Pacific Coast, Chemehuevi, Malaysia, Native American and Indigenous Studies Association, Pueblo identity on June 4, 2015 by uwpressblog.